Oh Little Star of Montpeyroux . . .
Can it be that Christmas is just over two weeks away . . . and Carolyn and Bill’s visit even closer? Time zips by. Joe returned to the States two weeks ago and I still haven’t written about our trip down to Bilbao. Perhaps a road trip retrospective for a future post. 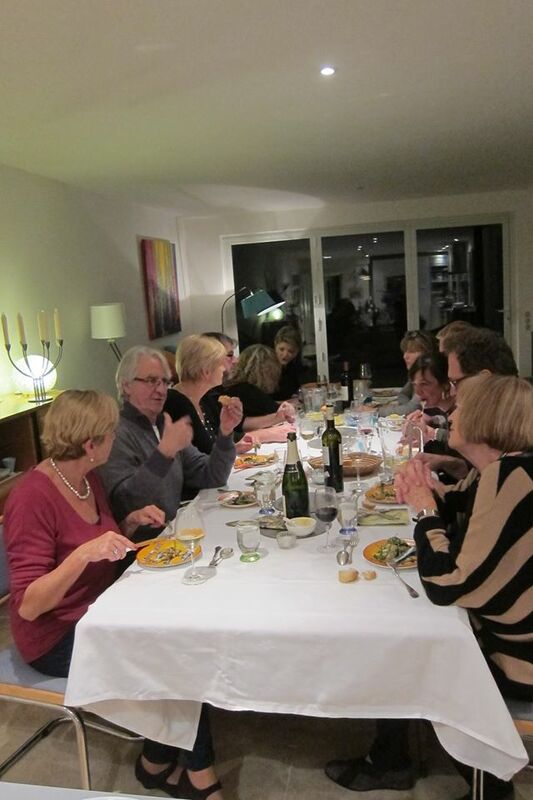 I wrote the last entry on Thanksgiving day, really a non event for me this year. I’d wondered whether my newly purchased car would turn out to be a bit of a turkey. Glad to say all the issues were worked out and I now have my carte grise–which means the car is officially registered to me. As I wrote on Facebook last week, I often feel a bit like a tourist hybrid–not quite a tourist, but not really a resident either. The process of buying and registering a car definitely made me feel less of a tourist as did the bank account I opened last week. I actually had to make an appointment to do this. Wanting things to happen immediately is, I’m finding, an American attitude which can lead to frustration in France. Anyway, I now have French cheques and a credit card which will help a lot when paying rent and doing business at all those places (autoroute toll booths, for example) that don’t take American credit cards. So Christmas is upon us. Blue stars are strung above the village streets and there are holiday markets and festivals everywhere. 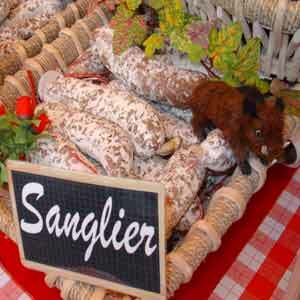 Last Sunday Montpeyroux held its marché´du Noel. I ogled the displays of dried and glazed fruits, bought a bunch of holly then drove to another holiday event, this one at the Chateau Cassan about half an hour from here. Stalls and stalls of tempting things for sale, all set out under the curved and gilded ceiling of a building which dates back centuries. At some point a certain Prince de Contii, a man who evidently knew something about gift giving, presented it to his mistress as a little token of his affection. It’s said she can sometimes be heard playing the piano, but I didn’t hear her. Perhaps she was Christmas shopping too. I bought English Xmas crackers and a Xmas cake with hard icing and marzipan. 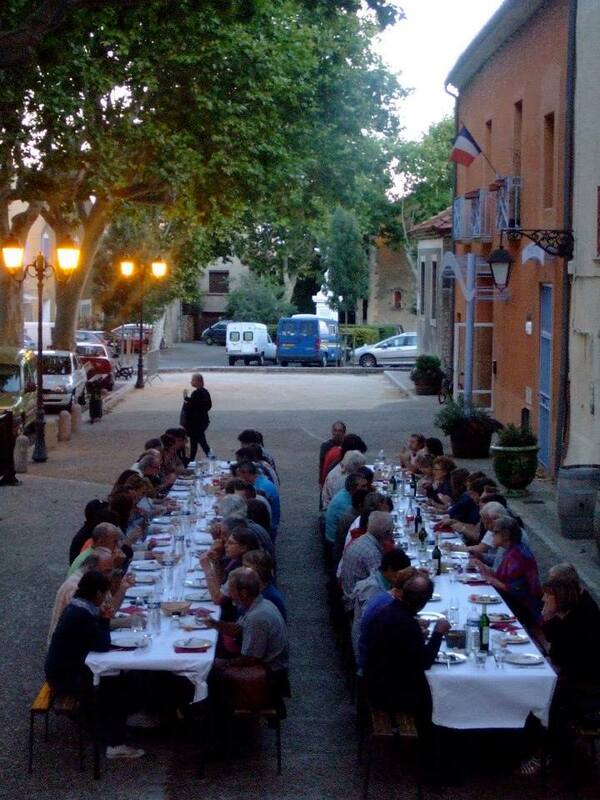 Life in the village can feel very quaint and French–the small shops, the traditions and sense of history. For me, that’s part of the charm of living in France, but it isn’t necessarily representative of French life in general. Yesterday, I had arranged to meet a friend at the Odysseum, a huge American style shopping mall on the outskirts of Montpellier. She has a sixteen year old son who wanted to visit the Apple store. Anticipating holiday traffic around the mall, I drove to the Mosson station and rode the tram in. I was early so I picked up a few things at Ikea then sat on a bench waiting for my friend. 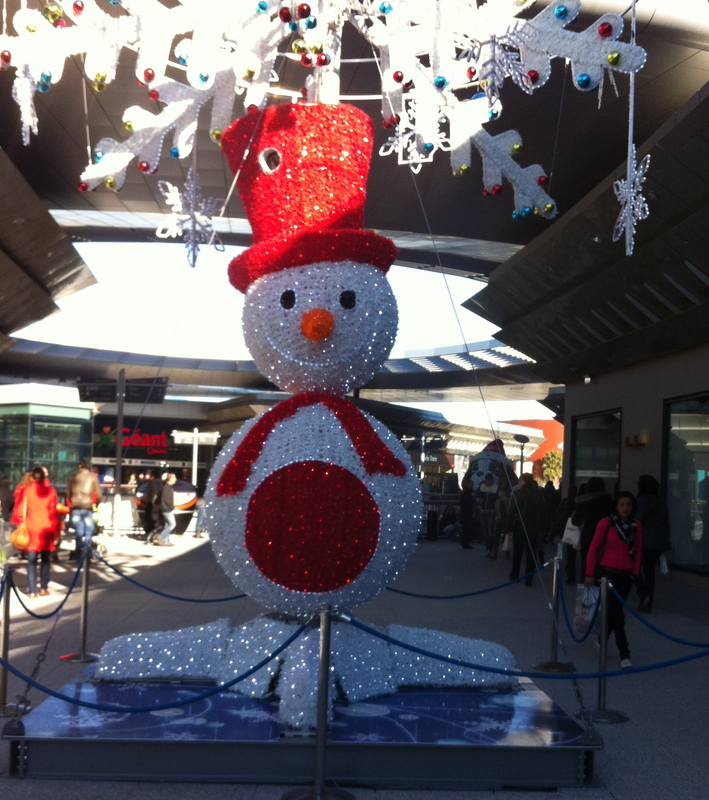 An illuminated snowman glittered in the bright sunshine, palm trees sported stylized icicles. As I listened to the canned music playing Dreaming of a White Christmas, I had to remind myself I wasn’t in Southern California. 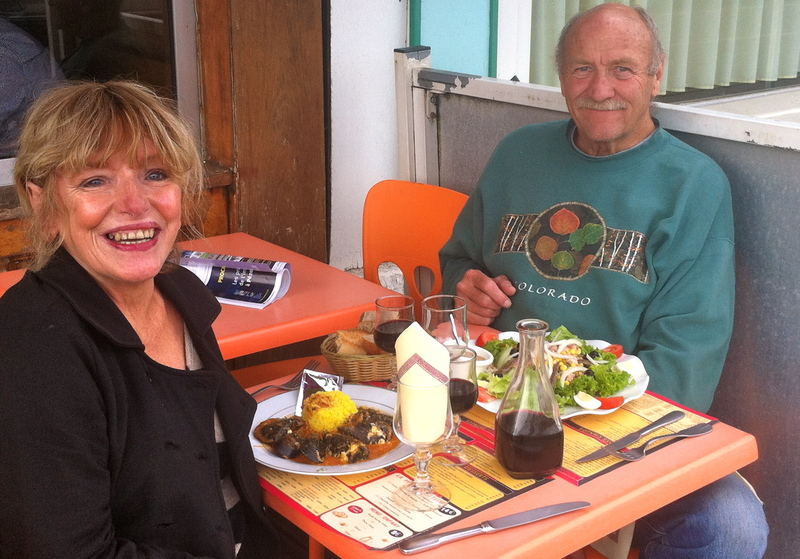 I have no doubt that life in France would be much more difficult without Skype,Facebook,e-mail and the on-line community. The ex-pat sites, there are many of them, are particularly helpful. Even before I left the States, I joined several, posting questions about everything from whether I should bring my hair dryer to France and the prospects of finding a writing group. (No to the first question, better to buy one and, to #2, since every ex-pat in France is writing a book there should be no shortage of other writers.) Survive France is one of my favorites. Last week, an urgent message was posted on behalf of one of the members who had recently suffered a brain aneurysm. At the urging of her family, she’d moved to a small village to be closer to them, but they’d dropped the ball and she was without resources or very much support at all. Worse, her internet was down, she was having difficulty arranging for the nursing care she needed and, not surprisingly, felt isolated and depressed. Within minutes of the appeal, the message boards lit up. By the end of the day, her internet was back up, nursing care had been arranged and she’d discovered the true generosity of the human spirit. Without Survive France, she wrote, she couldn’t have survived in France. A nice story any time of year, but especially heartwarming at this time. Merry Xmas . . . in case I don’t catch up before then! More Catching Up . . .
I’d originally intended to write at least once a week, more if inspiration struck. Now I’m struggling to make it once every two weeks. It’s not that I’m not inspired–from the fall displays of cepes, walnuts and pumpkins at the Saturday market in Gignac and rumors of wild boar in the vineyards to my continuing struggle with French, inspiration abounds. But all sorts of things manage to successfully draw my attention away from the computer. Just over a week ago, I heard Joe’s voice at the door and there he was in his Colorado sweatshirt, overflowing bags, reading material tucked under his arm looking much as he did the last time I saw him seven months earlier. Then he’d been waving goodbye before driving to Paris for a flight back to California. This time, he’d driven from Barcelona. Somehow it didn’t seem all that different from the many times he’d driven from San Diego to see me in Long Beach. As I write this, there is jazz playing, a glass of wine at hand. Chicken and ratatouille cooking for dinner. It’s good to have him back here. Although I’d read that the French don’t do much in the way of Halloween celebrations, this certainly wasn’t true in and around Montpeyroux. The guides at the Maison de la Poterie in St Jean de Fos were dressed as witches, all purple and black hair and warty noses, there were pumpkins and cobwebs (fake!) in the butcher’s window and by ten we’d run out of candy. 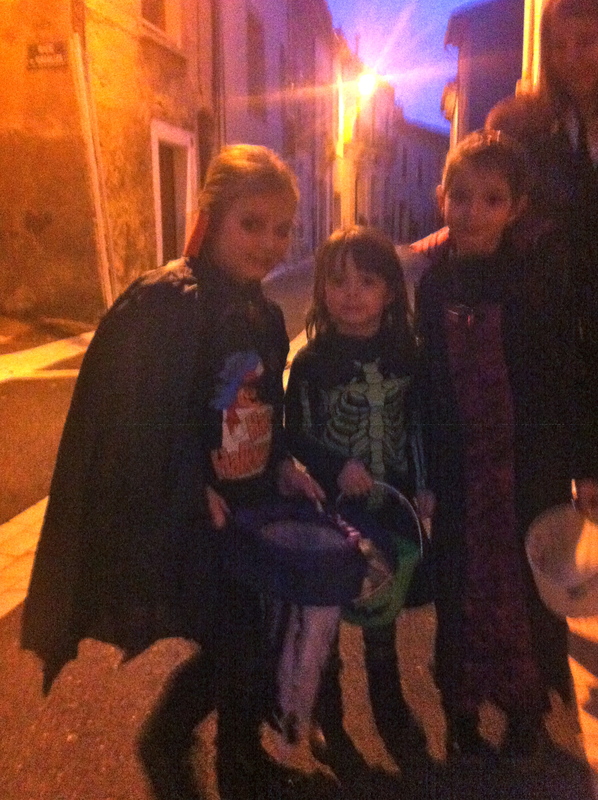 If there’s a French equivalent to kids yelling ‘trick or treat,’ I either didn’t hear it or didn’t recognize it. And now for the really big news. I’d intended to manage without a car in France and perhaps I might have if I were in the city, or even a larger town. It’s difficult in the village without wheels though. Through Survive France, one of the many ex-pat sites that have been god-sends since I arrived, I met Anna who lives in Carcassone and had a car she wanted to sell. 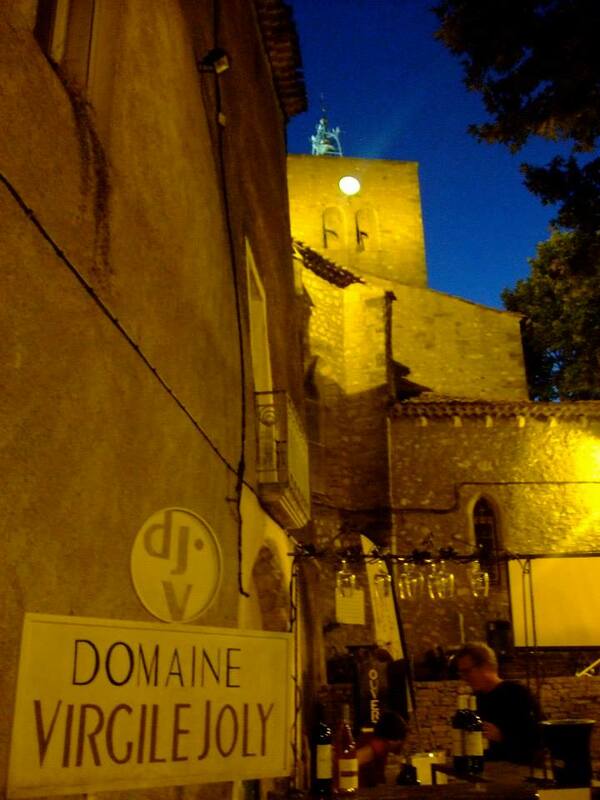 Monday, Joe and I drove to her house, about an hour and a half from here, bought the car–a silver 2005 Ford Fusion– and celebrated that night with cassoulet at Carcassonne’s medieval castle. 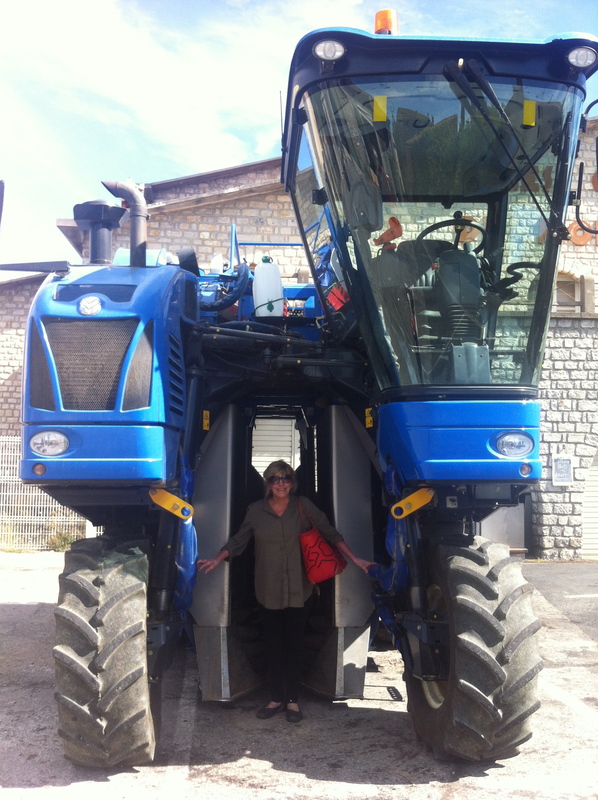 The next day I drove it back to Montpeyroux. Now I’m busy plotting my next adventure. Toulouse beckons. Writing? OK, I’ll get back to it eventually. The date marking my first six months in France passed while Marilla was still here. It seemed like an auspicious date and I’d intended to write about it, but we were too busy having fun for me to want to spend time at the computer. After finally managing to rent the car, we put our wheels to good use. One Sunday, we drove down to the beach areas near Montpellier–Palavas les flots, Aigues Mortes, Saintes Maries-de-la-Mere. Palavas is on a strip of sand dunes that separates a couple of lakes– Étang de l’Arnel and the Étang du Méjean– from the Mediterranean. The air had a salty tang that, living inland, I’ve missed. We saw pink flamingoes doing their balletic twisting, numerous seabirds and an equally numerous number of competitors for the few parking spaces available. Not wishing to compete, we drove on to the Camargue, all marshes and farmland and very different from the landscape in and around Montpeyroux. We saw the fabled white horses, no longer wild it seems, black bulls lying on strips of sand by the water. We took a boat ride, had beer and chips at a waterfront cafe and got hopelessly lost in Montpellier as we tried to return to Montpeyroux. Actually we spent a lot of time during Marilla’s visit doing the last two things–eating, drinking and (not necessarily as a result) getting lost. I’ve wanted to visit Collioure ever since someone told me that it was the anchovy capital of France. Although tourists have replaced anchovies as the chief commodity–we had to look hard to even find anchovies on restaurant menus– Collioure was charming and picturesque and definitely worth a return visit. We ate enough mussels to change Marilla’s mind about liking them. She decided she did, although perhaps not in the quantity that we consumed then. 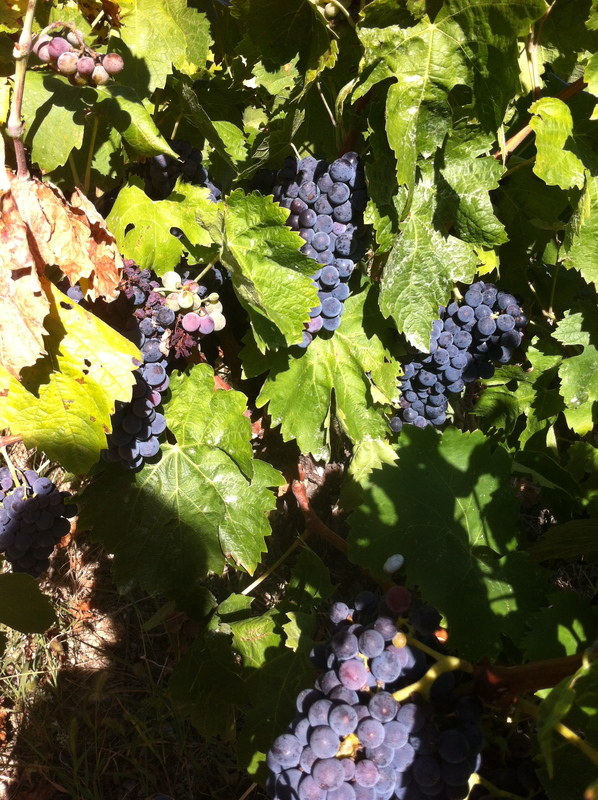 We also sampled, Banyuls, a sweet local wine. The following day we drove the picturesque, but hair raising, road down the coast to the Dali museum in Figueres, Spain. I think I preferred Dali’s house to the museum–more whimsical somehow with its glimpses into the artist’s domestic life. Yesterday, October 1, I saw Marilla off at the Montpellier airport and picked up Barbara at the Mosson tram stop. The airport is at one end of the city, the tram stop at the other. In between, I managed to once again get hopelessly snarled in the middle of Montpellier traffic and thwarted by street signs that seem to indicate one direction but lead to another. At one point, thinking I’d taken the road out of the city, I found myself instead in the underground parking lot of a shopping center. Once in, I couldn’t get out. Cars lined up behind me at the security gate. I fumbled in my bag for change. I found the change, but couldn’t find anywhere to deposit it. More cars lined up behind me. I got out of my car and spoke to the guy in the car behind me. He said something I couldn’t understand. The car behind him backed up, then the guy I’d spoken to backed up. Then I backed up. Parking lots in France, I suddenly remembered, require that you validate your picket BEFORE you get to the security gate. I parked the car, took the escalator up to the shops, downed a cup of café creme, validated my ticket and this time successfully managed an exit. In April, when I first arrived in France, the vines around the Pigeonniere in Exideuil, were stark and bare. 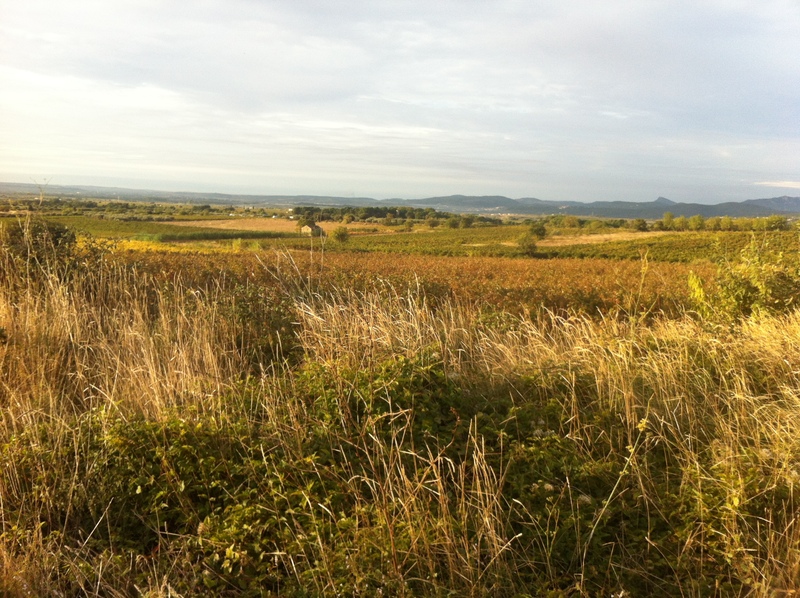 By June, I’d moved down here to Montpeyroux and the vineyards were green with new leaves. 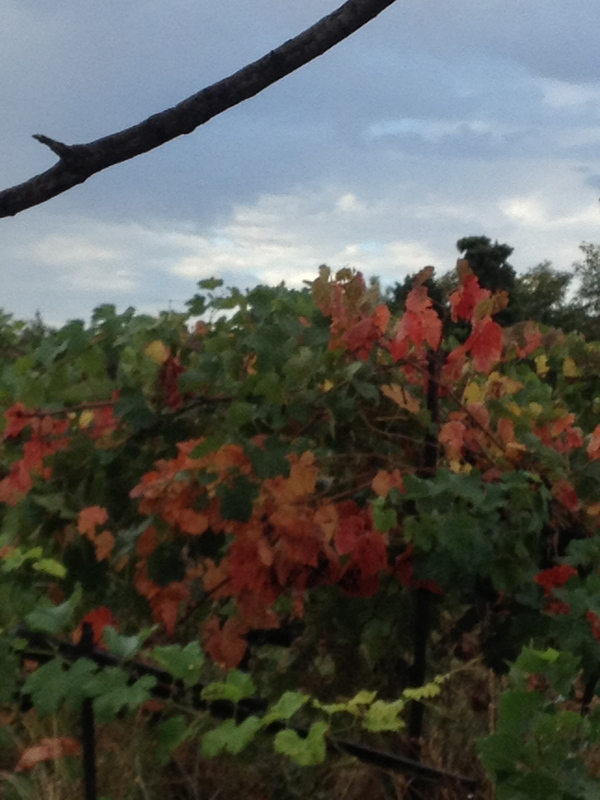 Now the vendange is, for the most part, finished and there are flashes of red and rust as leaves change color. I’ve spent a spring and summer here and autumn is very much in evidence with cooler mornings and evenings, but brilliant blue skies. 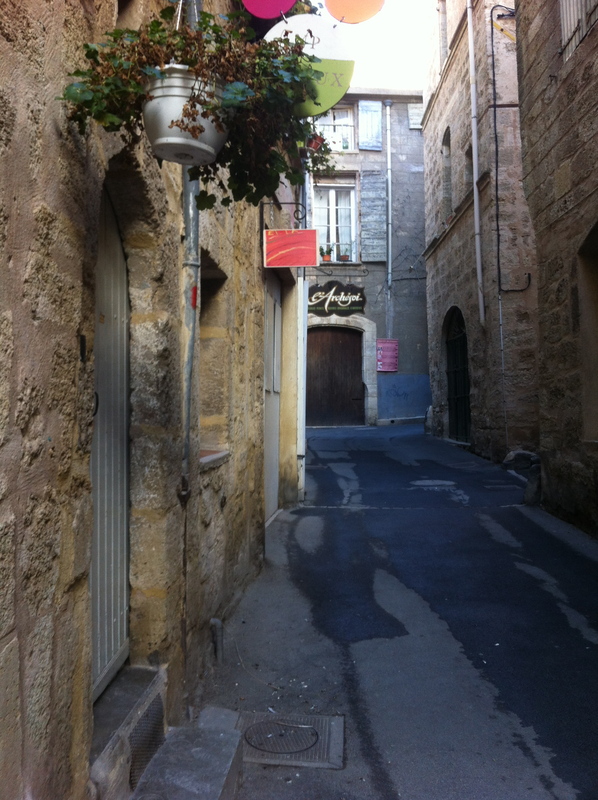 Just a month ago, Pezenas, where I go on Mondays for French lessons, was jammed with tourists. This past Monday the streets were empty, many of the shops shuttered. I’m keeping my fingers crossed that as winter approaches and I look forward to more visitors from the States, there will still be enough to keep everyone entertained. 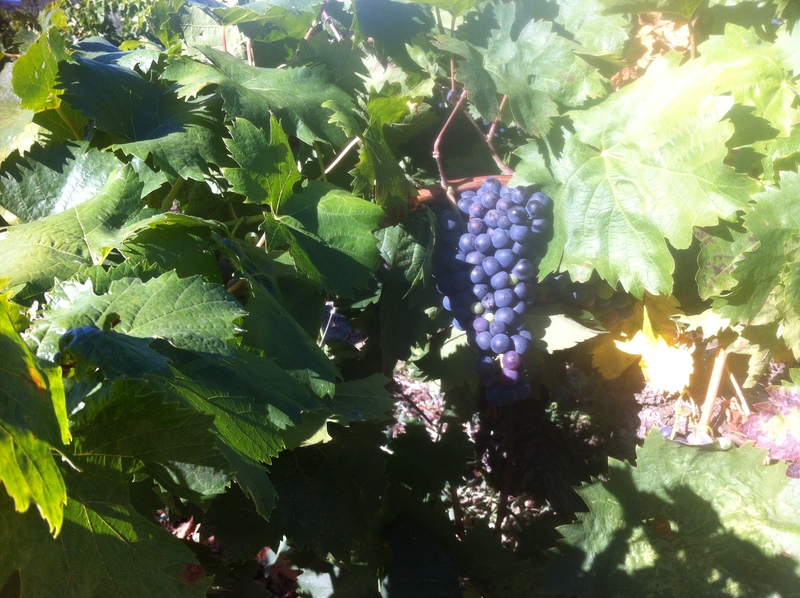 As I write this, Barbara is out walking in the vineyards. She was in half a dozen different European countries before she arrived here and she assures me that a little time alone with nature is exactly what she wants. I’m happy to oblige. Yesterday, we had a lunch of olives, anchovies, various cheeses and bread that Marilla and I bought at the market in Gignac last Saturday. (Barbara says thank-you, Marilla!) This Saturday, I’ll take Barbara and we’ll replenish the stock. The market is open year round and, if all else fails, always a source of entertainment.